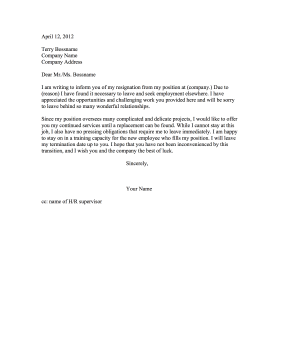 This printable resignation letter does not provide notice and encourages a flexible departure date. I am writing to inform you of my resignation from my position at (company.) Due to (reason) I have found it necessary to leave and seek employment elsewhere. I have appreciated the opportunities and challenging work you provided here and will be sorry to leave behind so many wonderful relationships. Since my position oversees many complicated and delicate projects, I would like to offer you my continued services until a replacement can be found. While I cannot stay at this job, I also have no pressing obligations that require me to leave immediately. I am happy to stay on in a training capacity for the new employee who fills my position. I will leave my termination date up to you. I hope that you have not been inconvenienced by this transition, and I wish you and the company the best of luck.